This particular lesson plan teaches about Jesus coming back to life. The resurrection of Christ is the most most important fact in the Christian faith and a precious truth to share with young children. We use GIDEON and his impossible battle to introduce the idea that Jesus was fighting a very hard battle too. Jesus was defeating sin and death. Exegetical Idea: Jesus rises from the dead. Pedagogical Idea: Jesus conquers sin and death, allowing us to live eternally with Him after our lives on earth are over. 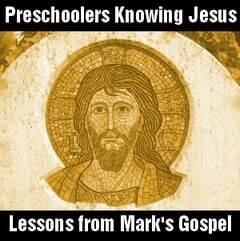 Cognitive Aim: Preschoolers will know Jesus has completely conquered sin and death. Affective Aim: Preschoolers will feel strength through Christ’s power to conquer sin in their daily lives. Behavioral Aim: Preschoolers will praise Jesus through song and prayer, and will memorize His Word. Kindle Curiosity (10 minutes) Description: Tell story about Gideon. Supplies: Bible outfits, Bible. God Revealed (15 minutes) Description: Hear the Scripture passage. Supplies: Bible, any props you may want to act out the story. Daily Knowing (7-10 minutes) Description: Memorize God’s Word, pray. Supplies: Notecards with memory verse written out for each parent. **Before the children arrive, have the Bible outfits ready. ASK: Does anyone know what an army is? BUT God told Gideon that this was way too many men. So, God sent all the men home except 300 soldiers. Can everyone say 300? (300!) God did this so that it there was no way the army could say they won the battle by themselves. Just like the Israelites had an enemy that they could not defeat, we too have an enemy that is impossible for us to defeat: sin and death. Today though we are going to learn about how Jesus fought for us on the cross, defeating once and for all sin and death and winning the victory! SAY: Today our lesson is found in Mark chapter 16. This is the Bible. It is God’s Word. He wrote it, so we know everything in it is true. We are going to learn about the greatest victory that was ever won! Who do you think won this victory? (Jesus!) Let’s hear God’s Word and see what happens! Act out the story together. You may want to use props. SAY: Every day we are in a battle against sin and Satan. A lot of the time we forget to even fight! We let our sin defeat us and have the victory. We give in to lying, anger, unkindness, disobeying parents, and lots of other sins! But we do not have to live like this! Because Christ has already won the victory and defeated sin, we know that we can defeat sin through His power. He makes us strong (do muscle arms). Because He rose from the grave and defeated death, when we die, we are now able to live forever with Him! SAY: Today we are going to make shields of faith. Jesus’s victory over sin and death protects us like a shield (cover yourself with your shield). But the war is not yet over on earth! We still have to fight with sin daily. You do not ever have to give-up, because we know one day Jesus will come back. And this time, He will defeat sin and Satan for good! Pass out the materials. As the children are decorating their shields, read to them Ephesians 6:10-17 and talk about how we prepare to battle against sin and evil. OPTIONAL: Play a game with your shields. Have balls of paper (or Styrofoam balls) labeled “death” and “sin’s power.” Divide the children into two groups. Have one group cover themselves with their shields while the other group throws the balls at them. Explain that when we believe in Jesus, He keeps us from the power of sin and death. SAY: We learn in the Bible that God’s Word is sharper than any double-edged sword (Hebrews 4:12). God’s Word is what we use in battle against sin (Ephesians 6:17). We have to know our weapons in order to fight the battle. If Gideon’s army did not know how to use their swords, they couldn’t have won the victory. We have to know God’s Word, our sword, in order to win the daily battle against sin! SAY: Today we are going to memorize Mark 16:6, “Don’t be alarmed,” he said. “You are looking for Jesus the Nazarene, who was crucified. He has risen! He is not here.” Do you think we can make-up some hand motions to help us remember this verse? Remind the parents how important it is for them to help their children review their verses all throughout the week. Encourage them to memorize the verse with their children. Provide each parent with a notecard that has Mark 16:6 written on it.